The end of Bantams Banter? Home › Interviews › The end of Bantams Banter? Dom Newton-Collinge and Tom Fletcher have a serious problem – the pair’s Bantams Banter podcast is proving too bloomin’ successful. About to reach the end of the second series, there is a huge doubt over whether the final show for this season will also prove to be their final show ever. A lot being an understatement. For a couple of ordinary City supporters with families to support – and who produce Bantams Banter for the sheer love of it – they admit that it has personally cost them around £1,500 this season to keep going. Set up and operating expenses, plus recording equipment maintenance, accounts for much of these bills. But what to you and me is a free show to download via iTunes is costing them £50-60 a month alone. Width of a Post meets up with Tom and Dom to interview them in the Valley Parade press box, an hour before City’s home game with Macclesfield is due to start. Although all four stands are sparsely populated as the PA system kicks into gear playing records, there are plenty of journalists and radio presenters milling about, preparing for an afternoon’s work. On the front row in opposite corners are the local radio rivals Derm Tanner and Tim Thornton, while Ian Ormondroyd is in deep conversation with City’s Head of Youth Peter Horne, and former ITV commentator John Helm is stood on his own, staring thoughtfully at the pitch. On the back row, sat at a desk next to the T&A’s Simon Parker, are Dom and Tom, in their usual positions for the match; ready to record their 51st – and possibly last ever – show. 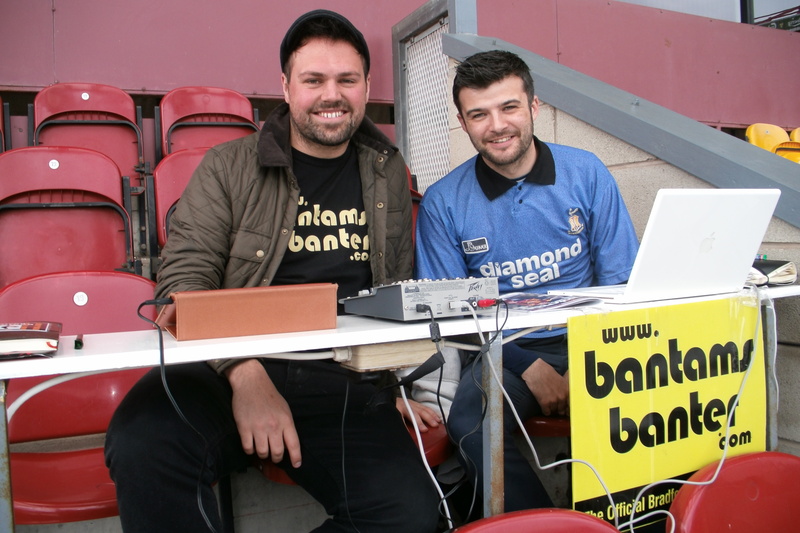 It was August 2010 that Bantams Banter was launched, at first carrying the dreaded ‘official’ tag and promoted by the club. Recorded from the Bradford Community Broadcasting (BCB) studio in the centre of town, while interspersed with clips from City’s League Cup victory over Nottingham Forest, a very unique addition to the range of City-related entertainment available for supporters was established, albeit fairly slowly. “When we started, we had done community radio so we were both very commercial radio sounding; it was all quite over-the-top voice driven,” explains Tom. 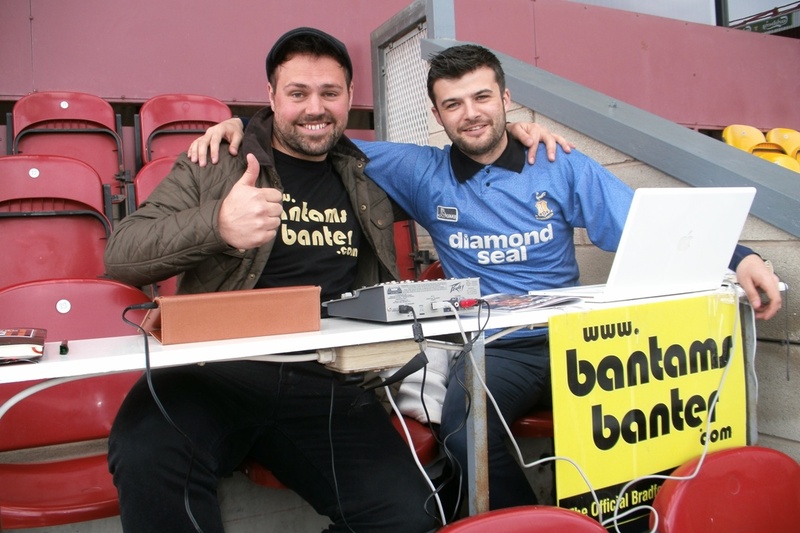 The pair had previously presented their own radio show together on BCB, but soon developed the idea of producing a podcast devoted entirely to the Bantams; involving recording themselves live at each home match as they chatted to each other, in what they hoped would be considered a light-hearted and humorous style. The first season proved to be hugely successful – particularly after a mid-season decision to switch from the studio to recording the show live from every home game. As Peter Taylor’s squad underachieved badly and Peter Jackson was brought in to keep the club up, re-living the ups and downs of matches through Bantams Banter was a refreshing and entertaining break from the growing doom and gloom. Tom and Dom were not afraid to be critical of players and management – a fact that quickly saw the ‘official’ titled dropped, even though the club continues to support what they do – and popularity among supporters snowballed. “Yeah, it all started off so well,” explains Dom. “But then; well the downloads didn’t go downhill, but we felt that our performances went downhill. That’s the problem with doing a podcast, when it’s really important that we’re at a game to get the conversation rolling. But if the team performances are bad, then we feel terrible. And then sometimes you feel as if you’re trying too hard to make it more entertaining than it is. 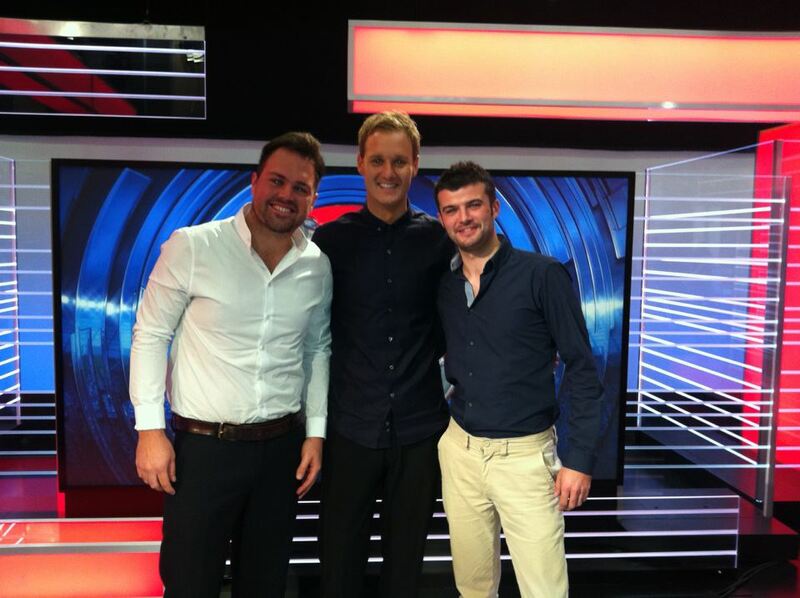 Tom and Dom with the BBC’s Dan Walker, in the Match of the Day studio. This dip in confidence mid-season was partly rectified by Tom and Dom fulfilling a childhood dream that we probably all share with them – being pundits on Match of the Day. As the flagship BBC highlights show was being relocated from London to Salford last November, the production team needed to record practice versions synchronised with the real one still going out live from London, to make sure everything worked before the move was completed. As a result of previous work done for the BBC, Tom and Dom were asked to play Alan Hansen and Alan Shearer in the fancy new studio – providing analysis on the day’s games – while Football Focus presenter Dan Walker took the Gary Lineker role. Not only do the number of downloads for Bantams Banter present a compelling case for them ‘making it’ eventually, they also have some very devoted fans amongst City supporters. One fan (“Duncan”) places bets on the first City scorer for them, while another (“John”) rocks up to the press box bearing sweets for them to enjoy during the game. They also have a huge Twitter following. “It’s like a family,” states Tom. As Valley Parade starts to fill and a young lad wanders around the press box handing out team sheets (“I used to have that job, now a 2-year-old does it. How do you think that makes me feel?” jokes Dom), the problem of how to continue Bantams Banter without racking up more sizeable losses weighs heavily. The pair have already attracted sponsorship from Napoleons Casino, and have also been supported by other local organisations such as SMF Print, but the show is still hitting them hard in the pocket. “You can’t thank a sponsor enough,” explains Dom. “Having a sponsor is a massive help and it’s helped with certain costs, like for the new website that we have, which was built for us. But the show costs much more than what they pay. And we know that you need to get a very specific sort of sponsor, where it’s going to be a lot of money. Despite their pessimism, they will look to explore all avenues to find a solution to this growing issue, and are hopeful they can continue next season producing something they clearly get a lot of pleasure from doing. “Oh yeah we love it,” declares Dom. “We’re lucky to be doing it, because we’d be watching City anyway. And do we want to sit there been miserable, go home and do nothing about it? Or do we want to be miserable, and then let everyone else hear us be miserable?! To find out more about Bantams Banter, visit their website here. The pair’s final show of the season (covering the Macc game) will be available shortly. The boys do an excellent job and the podcasts are a joy to listen to. I sincerely hope they find a way of being able to keep going. Perhaps charge 99p per downloaded pod, which should bring in at least £3k per game? ….Is Dom a little bit psychic because that last sentence is exactly what has happened, twice(the Wembley bit not the play-off bit obviously). Those two must be so happy their final year has been possibly our best and most terrifying ever. Whilst I am ecstatic that we have been promoted part of me will miss League 2, because the further up the Leagues you go the harder it is to feel that close connection to a team, an owner, a manager, that many League 2 team have. When money and success slowly becomes more important than heart and passion perhaps that is when it’s even more difficult for a podcast like Bantams Banter to have the appeal it has when we’re all just in it together, players and fans one in our devotion. Or perhaps that’s when we need it most, to remind us what it is that has finally moved us forwards for the first time in 14 years. I hope we Bantams never lose it, that feeling that they’re not just entertainers and we their audience, that we’re a Bantams family. Bantams Banter began to bring some humour to a decade of abject misery when everything that anyone(no matter what their credentials) tried, failed. Perhaps it’s fitting that their final podcast was the high we’ve been waiting for, fingers crossed we won’t need them distracting us from what’s happening on the pitch any more. But I will certainly miss those silly nonsense talking boys. It’s not just football they distract people from, they remind us that the glass should always be half full in all aspects of life, otherwise where is the fun….and also I don’t think there’s anything that lifts the spirit like hearing the reaction to us beating Arsenal…or Villa and getting to the league cup final…or beating Burton, or winning the play-off final. My word we’ve had a good season. Here’s to another! I think I’ve rambled on enough now.